Calzones aren't exactly healthy food, especially if they are stuffed with meat and large amounts of cheese. A calzone typically uses the same amount of pizza dough as a pizza crust and is meant to serve four people. Eating a whole calzone yourself can mean eating more than your recommended calories for the day. A calzone made with 13.8 ounces of pizza dough, 2 cups of mozzarella, 3 1/2 ounces of goat cheese and 2 ounces of prosciutto contains 601 calories per serving, or 2,404 calories for the whole calzone. 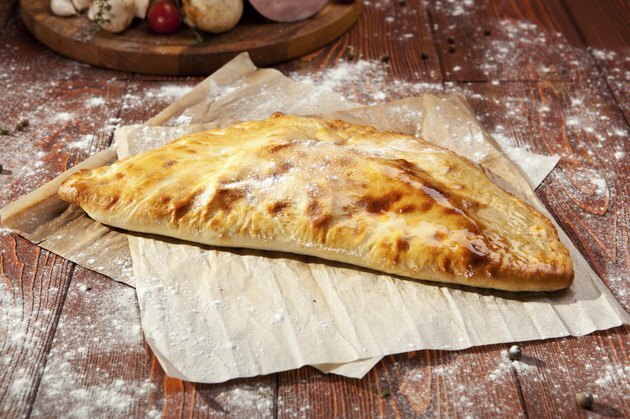 Making your calzone with 14 ounces of dough, 4 ounces of provolone, 8 ounces of ham and a little coarse-grain mustard for extra flavor results in a dish with 459 calories per serving, or 1,836 calories for the entire calzone. Use 10 ounces of pizza dough, marinara sauce, an ounce of pepperoni and a cup each of mozzarella and part-skim ricotta, and your calzone will have 425 calories per serving, or a total of 1,700 calories. Sausage calzones are similar in calories to other meat calzones. You can make a sausage calzone with 13.8 ounces of pizza dough, 1/2 cup of part-skim mozzarella, a cup of part-skim ricotta, 3 ounces of Italian chicken sausage, peas and marinara sauce for about 485 calories per serving, or 1,940 calories per calzone. Vegetarian calzones may be lower in calories than meat calories, but only if they aren't loaded with cheese. A calzone made with 13.8 ounces of dough, mushrooms, baby spinach, spices, 1/4 cup of whole milk ricotta, 5 tablespoons of Parmesan and 1 1/2 cups of Fontina has 522 calories per serving, or 2,088 calories per calzone. Making your calzone with 10 ounces of pizza dough, spinach, marinara sauce, spices and a cup of each mozzarella and part-skim ricotta gives you a dish with 400 calories per serving, a total of 1,600 per calzone. Use leaner meats and limit the amount you use, or cut out the meat altogether and replace it with plenty of vegetables, use low-fat cheese and less of it and use whole-wheat dough to make your calzone and the resulting dish will be lower in fat and calories and higher in fiber, making it a healthier choice. Avoid using processed meats, limit the amount of cheese and check the nutrition facts labels on other ingredients to find those with the lowest sodium; otherwise, your calzone may contain a full day's worth of sodium. Finish off your meal with a side salad, since you'll still need to watch your serving size and avoid eating the entire calzone. How Many Calories Does Lasagna Have?